KABUL, Afghanistan — In a few hours, Afghanistan's polls will open for parliamentary elections. Voting in Kandahar province was postponed for a week after an attack Thursday left several top Afghan officials dead. 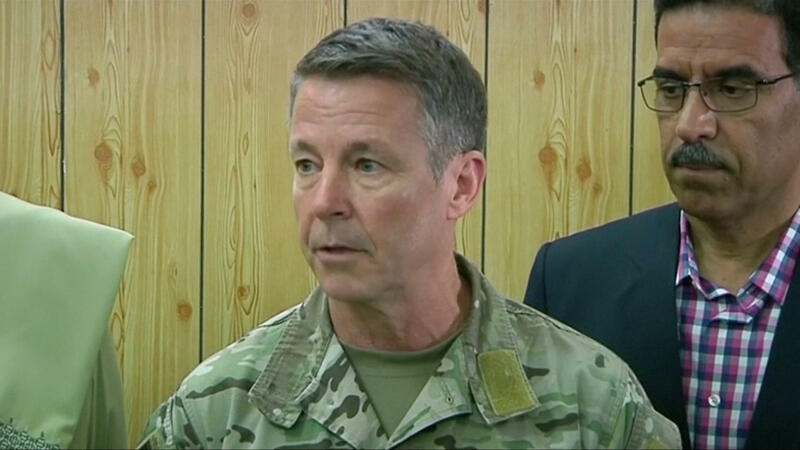 Gen. Scott Miller made a surprise appearance Friday on the streets of Kabul after the insider attack could have cost him his life. The Taliban said they intend to kill the general, but he's not convinced. "My assessment is that I was not the target," he said. "It was a very close confined space, but I don't assess that I was the target." It's a space so confined that the general drew his own sidearm when the gunman opened fire. A U.S. military spokesman in Kabul confirmed those details, saying "when there is a threat we draw our weapons. It's what we're trained to do. General Miller is no exception." He's also no stranger to close combat. Miller is a career warrior who was among the first U.S. troops into Afghanistan after Sept. 11 and a commander of America's elite special forces. Friday's public appearance – surrounded by armed Afghan soldiers – was aimed at reassuring a nervous Afghan public after Thursday's attack. "We'll continue our support. My message to the people of Afghanistan has been very consistent. You have every right to be proud of your security forces and the preparations they've made for this election," Miller said. Being proud of their security forces is one thing. But trusting those forces to protect them is another as voters by the millions go to the polls in defiance of Taliban death threats.